does anyone know how I can display this plot? 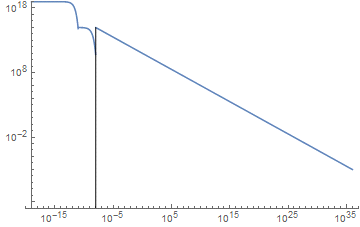 Trying to display it mathematica seems to give up somewhere on the second piecewise function, and the vertical line displays in a different position? Thanks! PS Could someone explain why/how plots or graphics choose their coordinates, and how epilog chooses theirs? I figured out they don't seem to match, in particular for using LogLogPlot. many thanks! LogLogPlot effectively generates a curve in which Log[f] is plotted against Log[x], but with tick marks indicating the original values of f and x. Note how Log, being Listable, automatically threads over all coordinates within Line.